Jamison Rd., former NY 422, heading east from NY 16/78. There are dozens of NY 20A shields posted for this detour and not one US 20A shield. All of them but one were mercifully covered up, though. The other is on NY 400. I don't think Mill Rd. 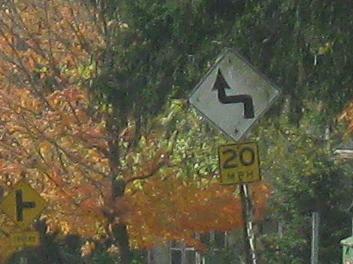 was ever a state highway, but this old S-curve sign as it leaves US 20A west of East Aurora matches 1960's-spec NYSDOT signs. 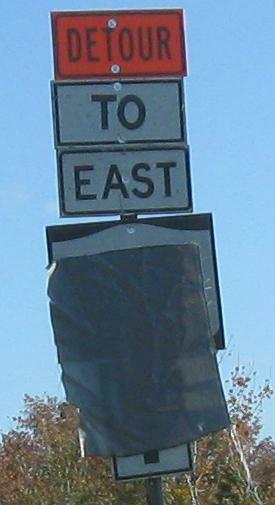 This WB shield has been here by Cazenovia Creek since before the detour. Maybe the contractor saw this error and decided it was correct and all those other shields must be wrong.